In honor of my 100th YouTube video, I thought it would be fun to do a remake of the very first YouTube video I ever made for one of my favorite smoothies, "Chocolate Ice Cream Smoothie". I filmed this first video about 4 1/2 years ago when I was pregnant with Avery and wanted to show the world just how yummy and easy this delicious smoothie was. I had some experience with blogging, but clearly not with filming or video editing...but hey, you gotta start somewhere right?! Sometimes I get so caught up in where I want to be and how it seems like I'll never get there, that it's good to look back and reflect on how far I've come. So in honor of that first video of mine, I had Avery join me as we mixed up some yummy vegan chocolate goodness. Enjoy! 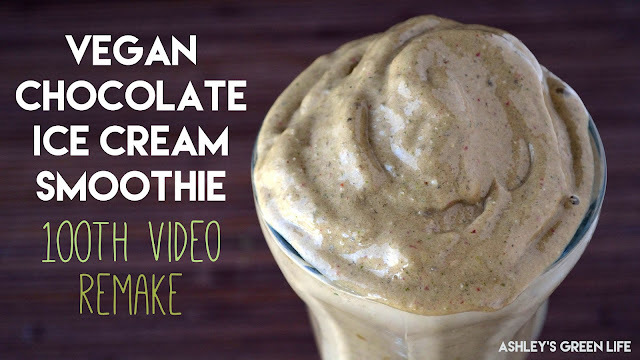 "Vegan Chocolate Ice Cream Smoothie"
Blend and enjoy! If you don't have a Vitamin, it might be helpful to blend the milk, hemp seeds, spinach, chia seeds, and cacao powder first and then add the frozen fruit so everything can get blended a little easier. Thanks to those of you who have been with me for all these 100 videos and for those of you who have just recently joined our little green community, so glad to have you. I can't wait to post another 100 videos for you all. Lots of love to you greenies! See you Sunday for another new video. Where I've Been & What's Coming Up!